When it comes to enduring charity partnerships, Cash Converters’ relationship with the wishes charity Dreams Come True probably isn’t the first that springs to mind. But the company, which buys and sells pre-owned goods and has almost 200 stores in the UK, operating through a franchise model, has raised more than £400,000 over the past 10 years for the charity, which works to enrich the lives of seriously ill children and young people. The partnership began in a fairly informal manner, according to Carl Murray, managing director of Capital Cash, the largest Cash Converters franchisee. A small panel of franchisee and company representatives agreed to find a charity partner for the company and came up with a few possibilities, eventually settling on Dreams Come True. "It’s such a lovely charity and you get to see the result of your work," says Murray. "With the bigger charities you don’t get to see the end result. When you meet the kids and you see the difference it makesto them, it makes you want to cry." He says the relationship helps the company’s image, but also gives the organisation a wider focus. "The franchises tend to do a lot of quiet work with local groups as well," he adds. The early days of the Dreams Come True partnership revolved around golf days and auctions, but in recent years Murray, along with Paul Graham, his finance director, and Richard Addison, owner of the Rhyl Cash Converters franchise, have undertaken four major bicycle rides that have raised significant funds for the charity. 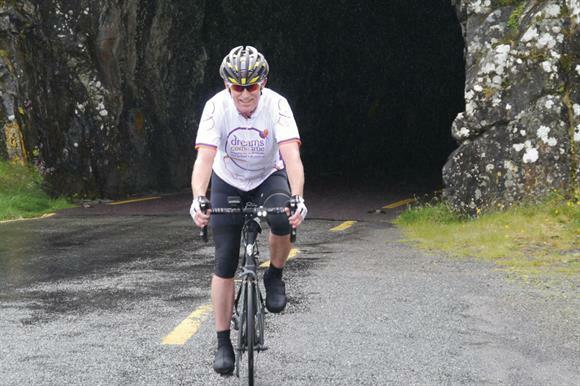 The most recent one, completed in June, involved the trio cycling a 510-mile route from Mizen Head to Malin Head, Ireland’s equivalent to the Land’s End to John O’Groats route, raising £50,000 for the charity. Funds raised by the rides have come from a mixture of sponsorship and, more recently, a scratchcard game and then a raffle operated in individual stores. Murray says there is no set timeframe for how much longer Cash Converters’ partnership with Dreams Come True will continue, but it shows no sign of coming to an end soon. "You never know, but there is certainly a lot of love for the charity and what it does," he says.